The research department develops algorithms for plan-based control of autonomous mobile robotic systems. Fields of application are, e.g., automatic agricultural machines and driverless transport systems. The field of research includes the three-dimensional sensoric environment perception and the automatic interpretation of the sensed data: Using methods of Artificial Intelligence, the machines determine the semantic context of their current environment. Based on that knowledge, the machine may determine action plans, whose execution allows it to achieve given action goals autonomously. All these processing steps need to be robust against uncertainty and incompleteness of the knowledge and the perception of the robot environment. 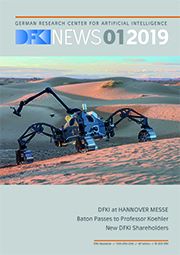 The research department Plan-Based Robot Control benefits from the basic application-oriented research of the Knowledge-Based Systems Group at the University of Osnabrück, headed by Prof. Joachim Hertzberg.